Recently I purchased some great Japanese alphabet fabric. 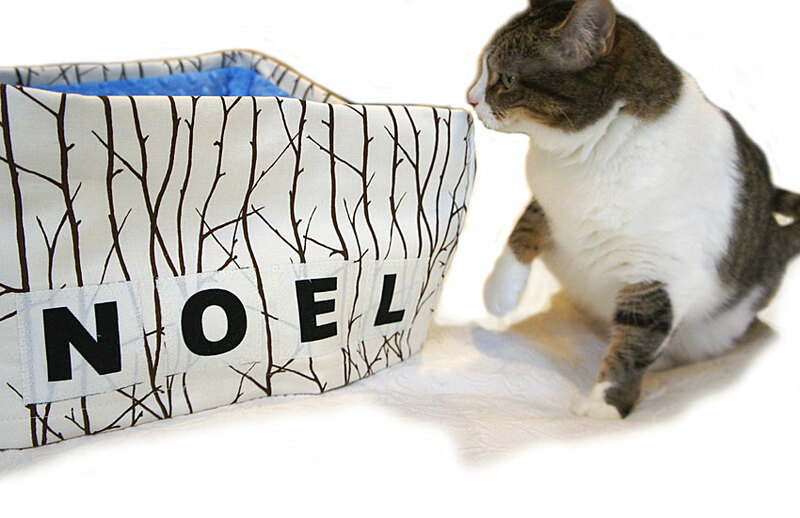 It’s a very nice black & white print, and I will be using it as an option for adding a pet’s name to the surface of my pet beds. 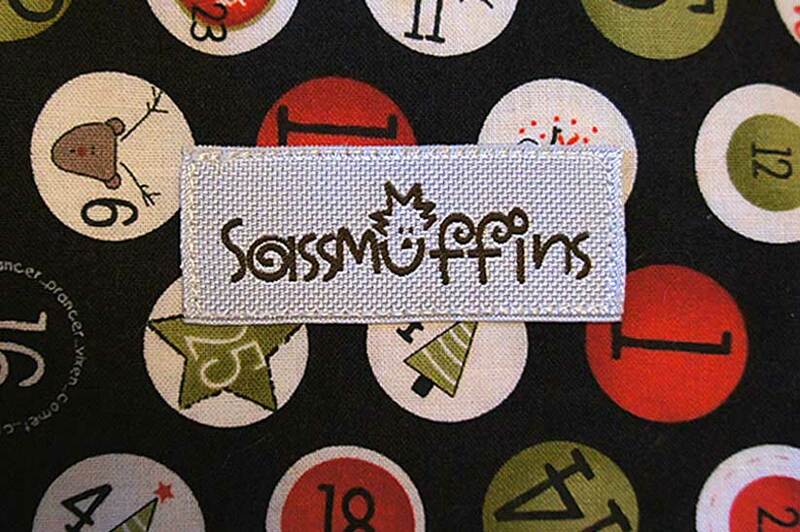 This was my first request for a custom pet name using this fabric, and I think it turned out very nice. It has a kind of Anthropologie look to it, don’t you think? 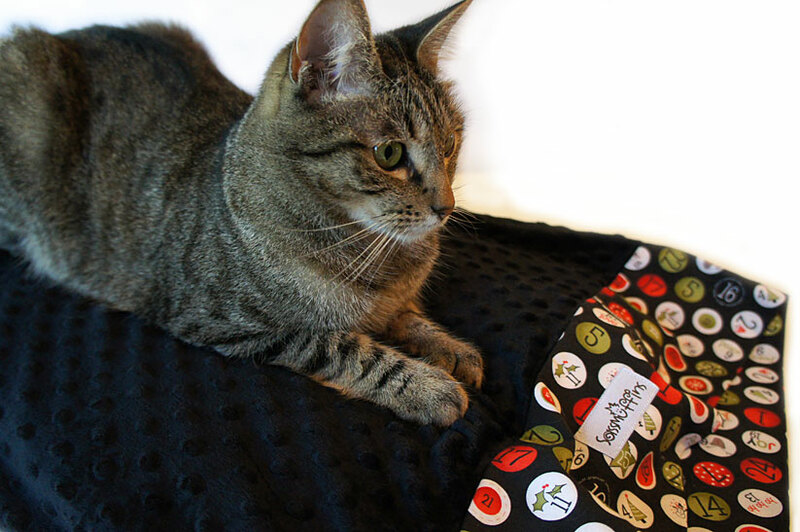 I am super excited today to be uniting two of my very favorite websites – Sew Mama Sew and Blog Paws – via this very special giveaway of two of my pet products! 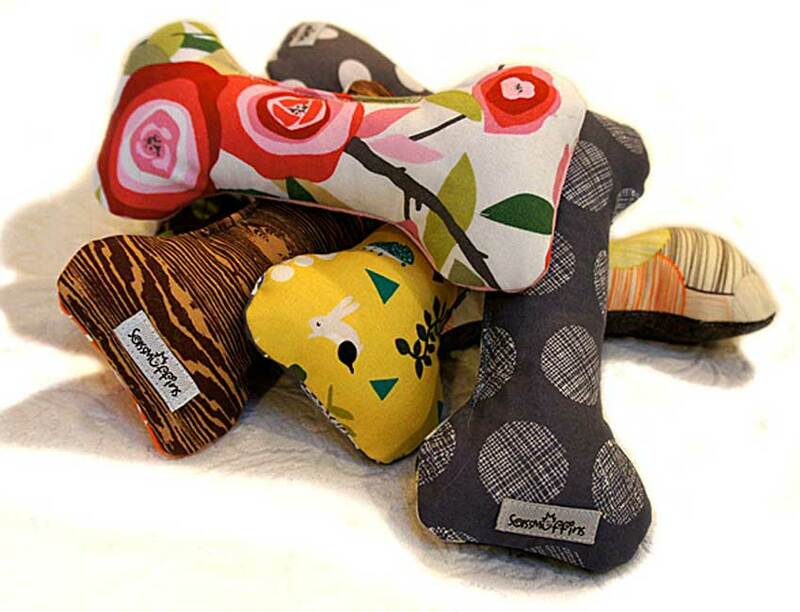 The giveaway is hosted twice a year by Sew Mama Sew, and the Wordless Wednesday is hosted each week by Blog Paws. Please be sure to follow the links in the sidebar to see both of these wonderful sites. There are so many wonderful giveaways on the Sew Mama Sew site this week, both for sewing/crafting supplies, and for handmade products. And with Christmas just around the corner the timing for this huge giveaway could not be better! Winners for this Sew Mama Sew giveaway have been notified. There were so many great entries and I very much enjoyed reading each and every one. 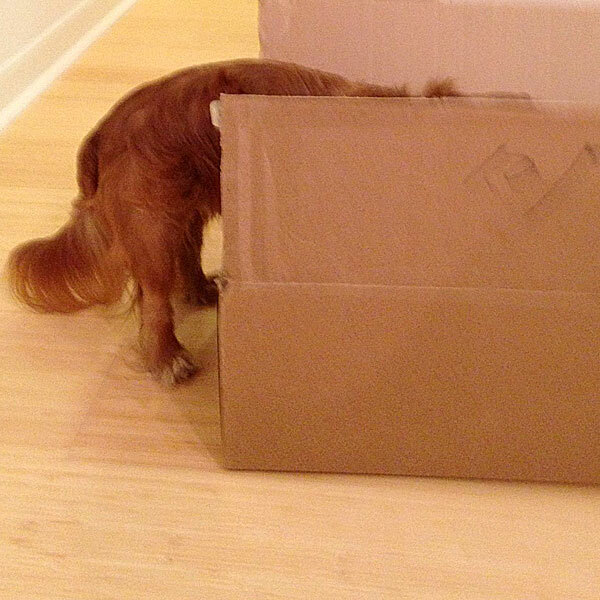 As there were so many entries I decided to give away a second dog toy. Winners for each prize are named under the prize. Thanks everyone for participating and have a wonderful Christmas! 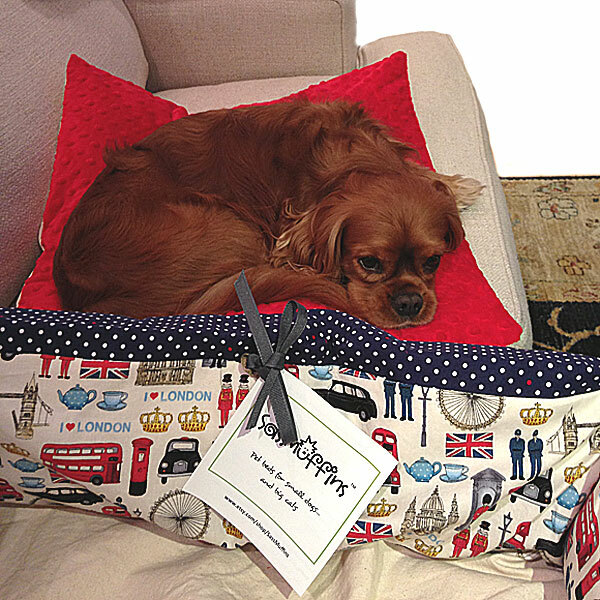 My first giveaway is this lovely Christmas themed pillowcase pet bed cover. 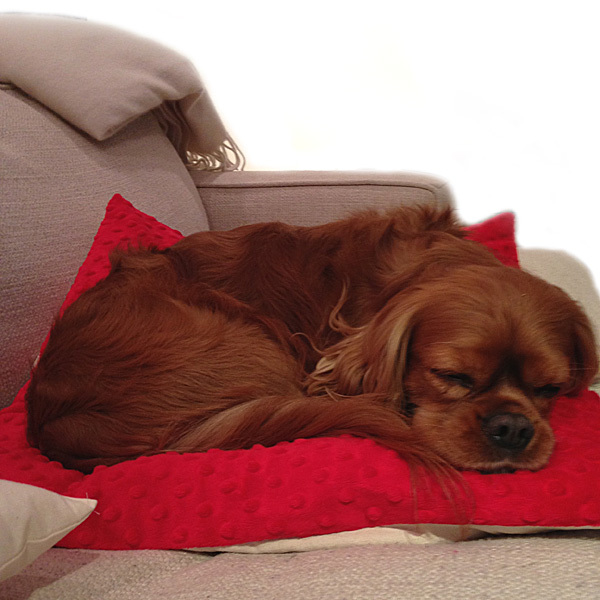 This pet bed cover fits any standard to standard/queen sized pillow, and makes a very special resting spot for your pet! 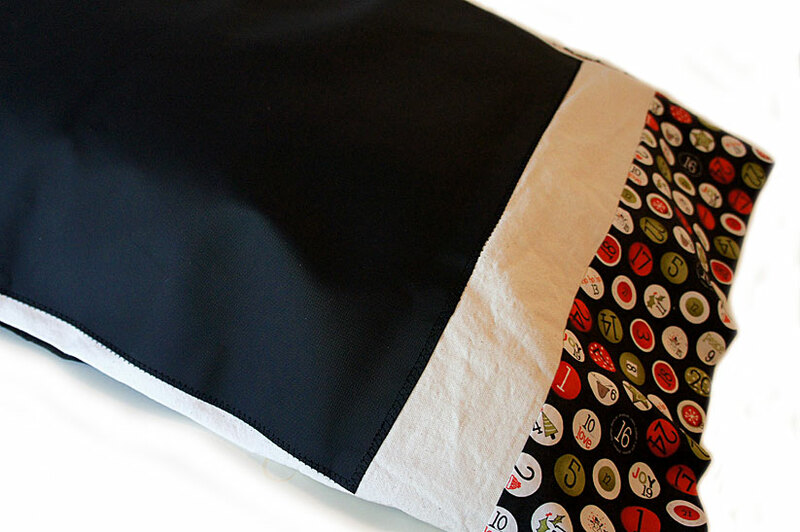 It is durable, easy to clean, and folds flat for travel or storage. 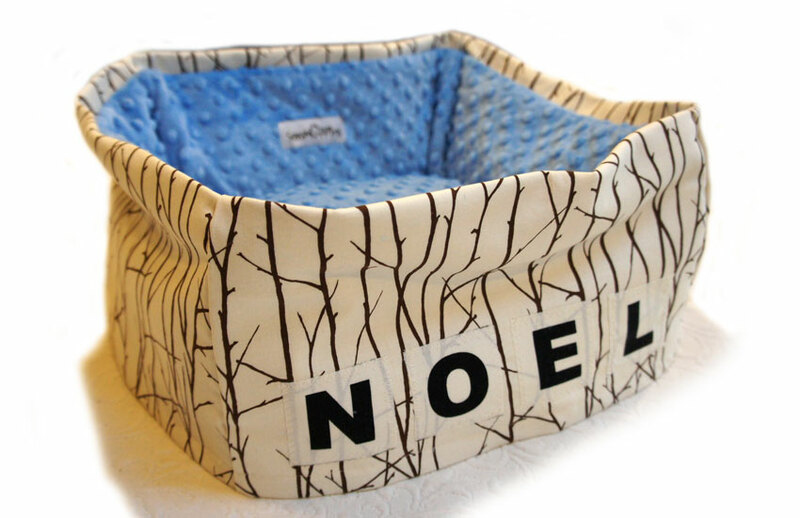 Black minky fabric with billiard-style Christmas design on the cuff brings a bit of whimsy to your pet bed for Christmas. 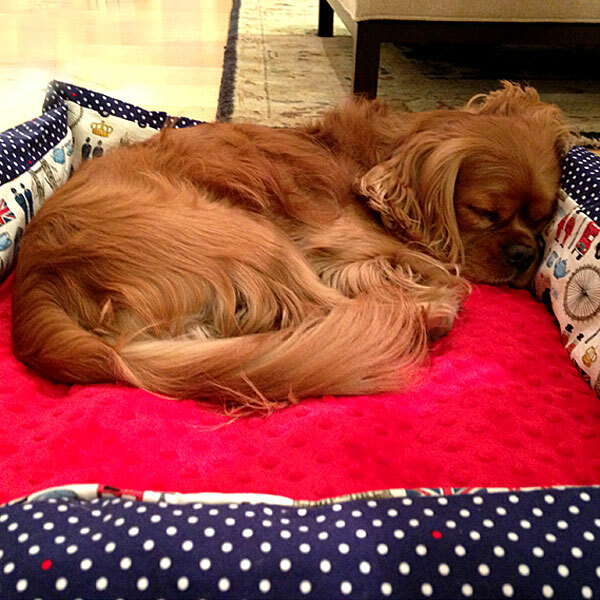 It has a french seamed cuff and large section of Toughtek slip-proof waterproof fabric on the underside to make the pet bed really stay in place. 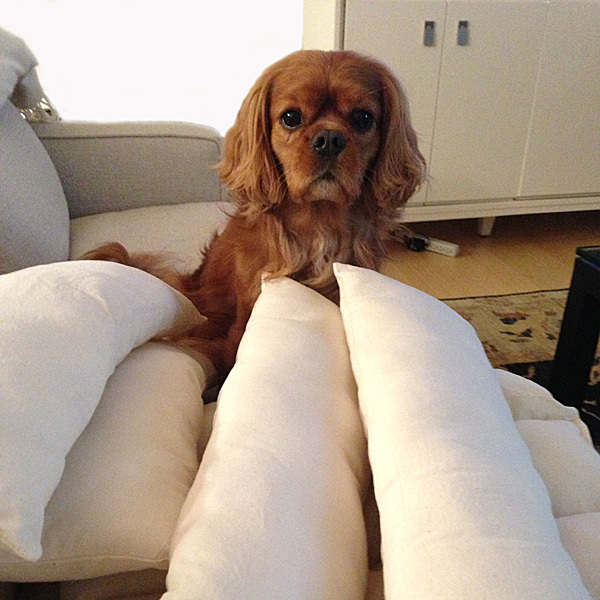 Just purchase a pillow (or use one of your pillows or other stuffing) to make this bed complete! 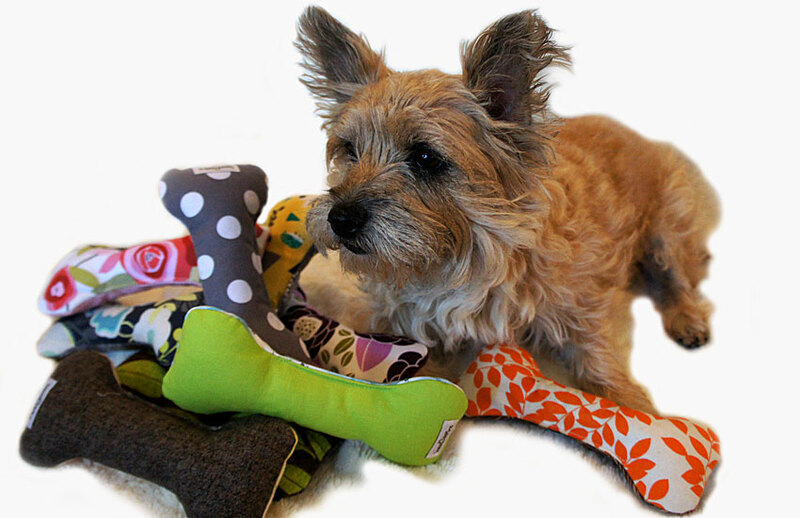 My second giveaway is your choice of any one of the cute “Mod Stick” dog toys you see in this photo! Custom made from a variety of fabrics, this irresistible squeaky toy is made from a double layer of canvas covered in quilt cotton, and measures 8″ long by 3.5″ wide. It’s easily cleaned (as is the pet pillowcase) by just popping into the washer and dryer. Clean on cold wash and low dry. Entering this giveaway is very simple! Just leave me a comment below, and let me know your pet’s breed/type and name, and whether or not you have any special things you do with your pet at Christmas (cute outfits, take them to grandma’s house, etc.). I can’t wait to read all your responses! This giveaway is open until December 13 at 5 p.m. PST, and is open to all US participants only. Winner will be randomly selected and announced in this post on Sunday, December 15th, so be sure to check back then. 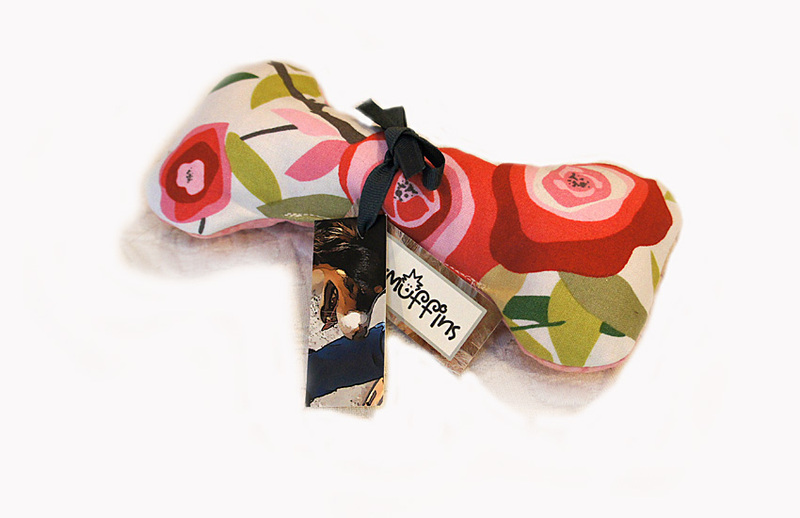 Also please go and visit the Sew Mama Sew website to see all the other fabulous giveaways!! And if you prefer to make your own things stay in touch, because this spring I plan on making pdf patterns for all my wonderful pet products, as well as other goodies for your home! These are the last of the photos I took from the Houston International Quilt Show. I have added them in gallery style for your viewing pleasure; there are 28 total photos. Each one is a truly an amazing piece of art. In many cases I have only shown a portion of the quilt, in order to keep each in a square photo format. 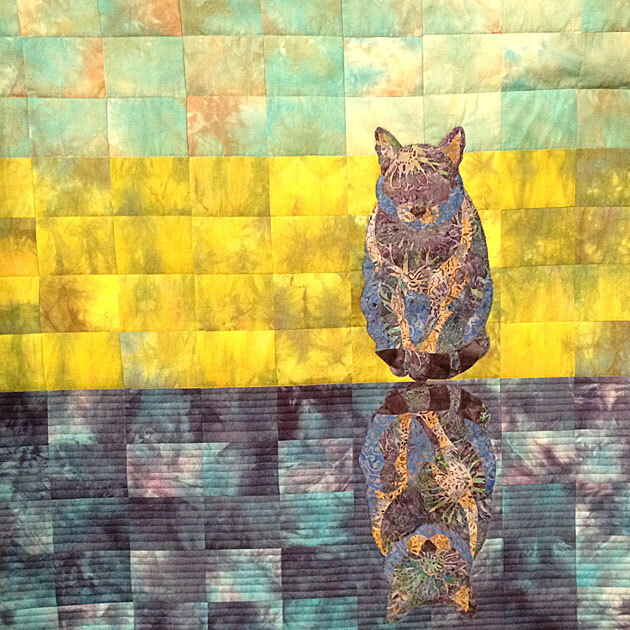 You may click on any quilt photo to view it in a larger format. Enjoy!! 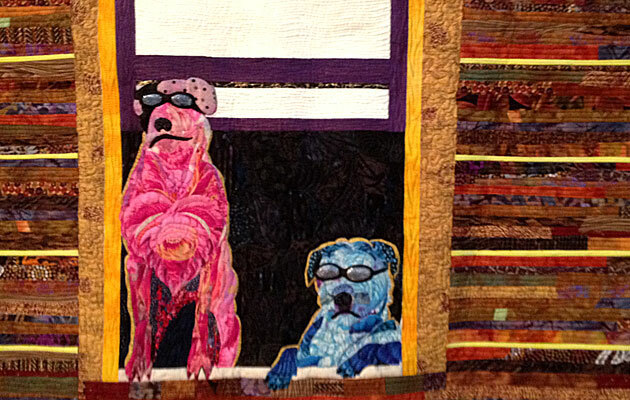 The trip last weekend to the Houston International Quilt Festival was a feast for the eyes. This year the festival had a special “Raining Cats & Dogs” competition category. 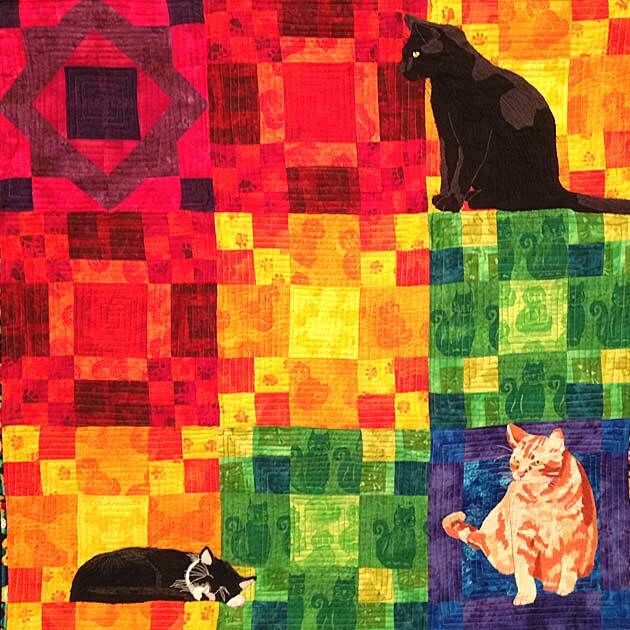 I wanted to share these amazing quilts with you. Enjoy your trip through this virtual art gallery! And if you have a favorite, do comment and let me know. They are all so wonderful! 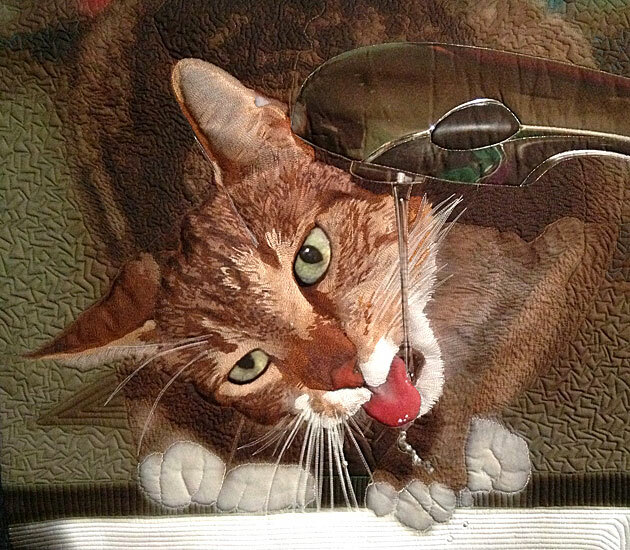 I urged my cousin’s cat, Taz, to come to the kitchen sink to drink, and she obliged as I captured her in this funny pose. Kool in Ketchikan was inspired by a photograph I took of two dogs – both wearing upside down sunglasses, perched in an open window of the Bayside building in Ketchikan, Alaska. It was drizzling, I looked up and there they were. The pit bull mix dogs, mostly white with black spots, are iconic to Ketchikan, both to locals and tourists. I wanted a playful reminder of our visit to Ketchikan, consequently one dog is pink and the other dog is blue. It literally rains and pours at our local shelter with pit bull mix dogs. 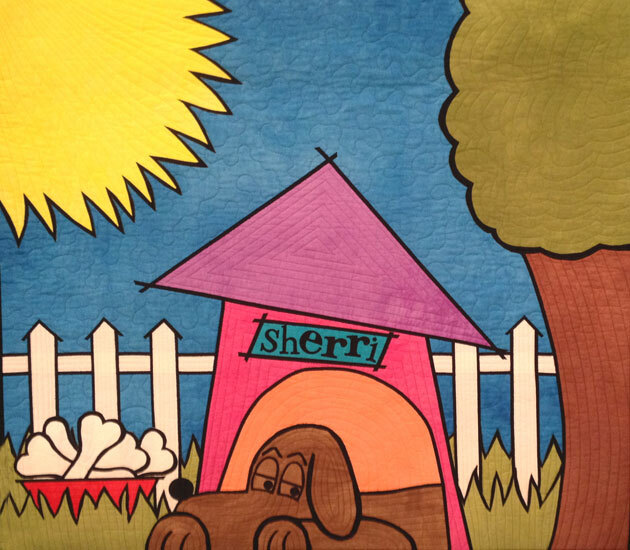 Won’t you please consider offering a “forever” home to a dog from your local shelter? We did. His name is Yuba. He, too, is part pit bull and a big love. In August of 2008, my son found a tiny kitten under the hood of the car, covered in grease and fleas. He cleaned her up and she won his heart, as well as the scorn of our other two cats. Boris, the black cat, is determined to be Alpha male, and is also proud of his prowess at catching (catnip) mice, while Moose, the orange cat, is the might hunter of lizards and bugs, who’s afraid of everything. Oslo the kitten sleeps, dreaming, no doubt of how best to annoy her big brothers. 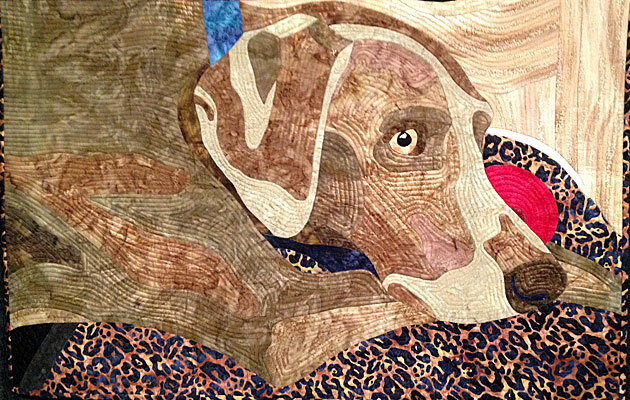 This quilt was made from a snapshot of my weimaraner, Charlie. He is lying at the foot of my bed waiting for his daddy to get home from work to play with his ball. 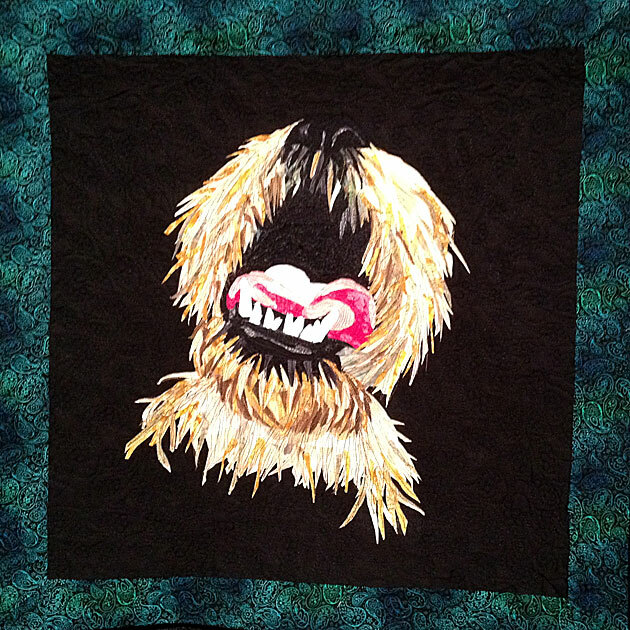 The inspiration for creating this Yogi Bear quilt came from a special love I had for my pet, a shelter dog we rescued at 16 weeks old. Yogi had the most adorable face that peeked out from his cage. I felt it best highlighted his unique character. Everyone who was him commented on his unique look. Yogi Bear was only with us for a short five years. Making this quilt has helped me to deal with the loss of Yogi. After creating a collage on a playing card, manipulating it in Photoshop in a class by Red-Dog Enterprises, my pup was printed by a large format printer onto fabric. 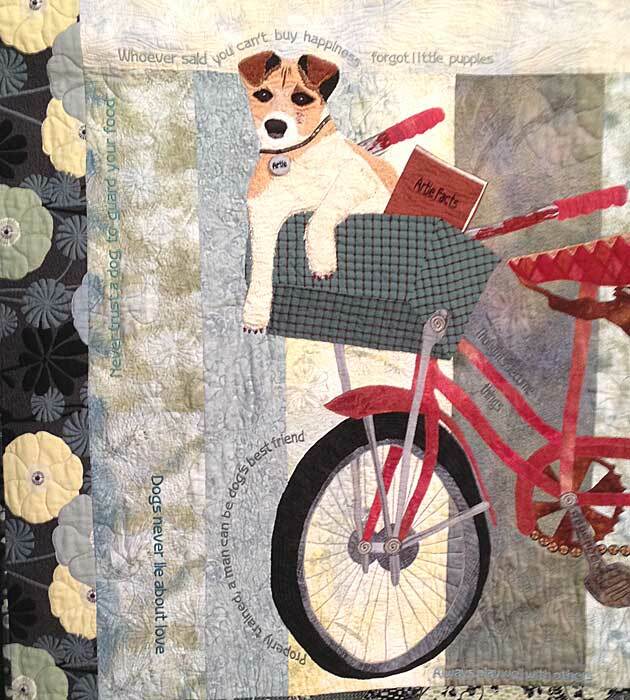 I pieced varying sized improvisational star blocks using Marcia Derse fabrics, quilted my adorable lab and stitched him to his background. He would be at home anywhere! Unfortunately I do not have the details for this quilt. I have long known that dogs have their own set of rules and facts about how the world works. 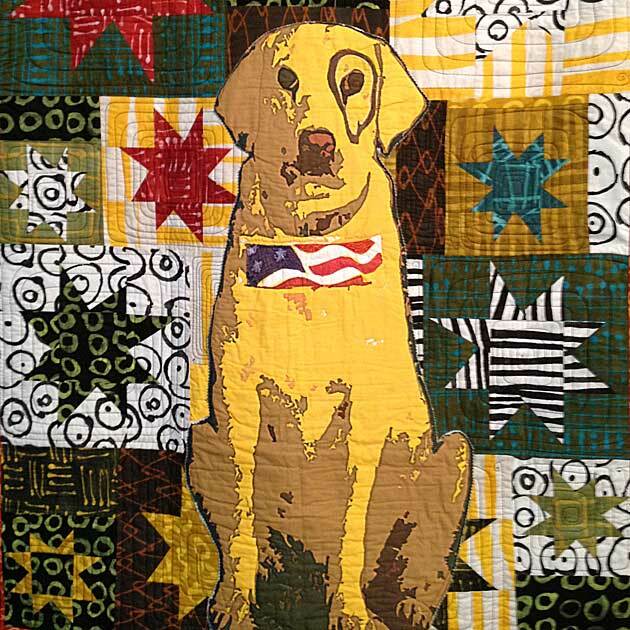 So, when faced with a Mendocino Quilt Artists challenge to create a quilt based on the theme “Artifact,” my mind went to dog facts. 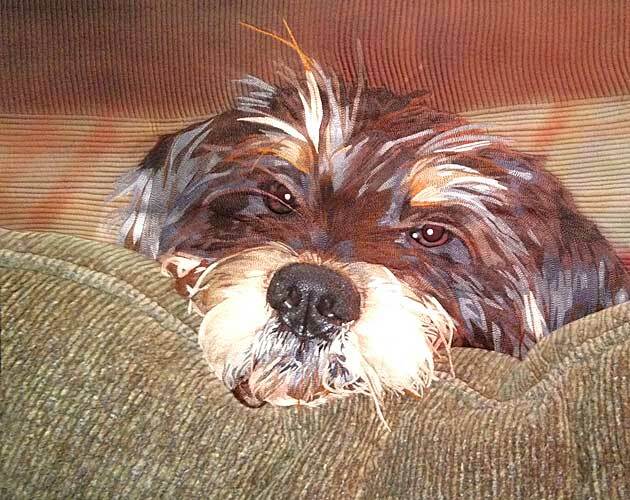 Artie is the representative of the dog world, and these are some of the known dog facts. As soon as I found ou about the “It’s Raining Cats and Dogs” special exhibit, I sat down and sketched out this quilt. The pup on the quilt is keeping a wakeful eye out for any bone thieves! A friend’s dog had the habit of lying on the back of the couch and watching me while I stayed with them. Fortunately, I had my camera and transferred the photo to polyester using disperse dye digital transfer. 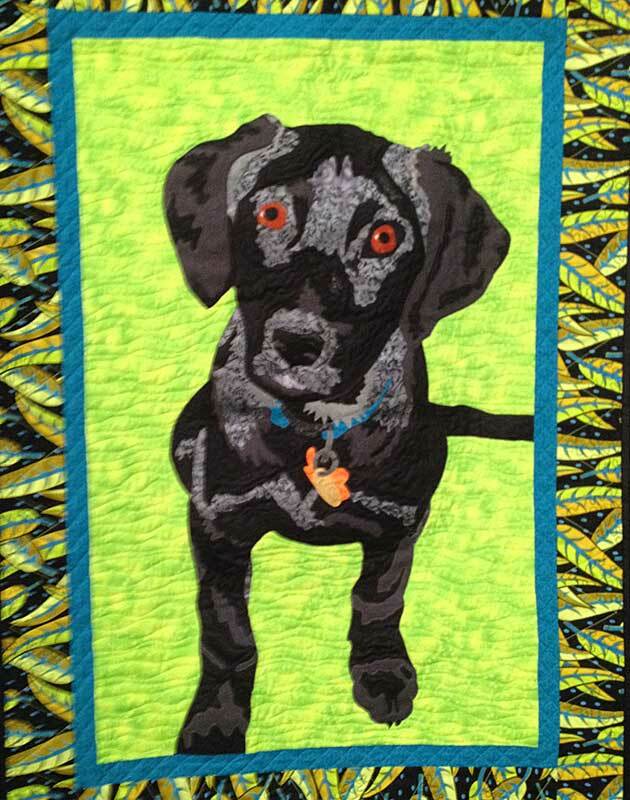 I began this quilt in a class taught by June Jaeger in Sisters, Oregon, It’s from a photo of my dog, Shade, when he was a puppy. I wanted a small dog. He was 19 pounds at the time. He grew up…now he’s 80 pounds. While his name may be Shade, he brings a lot of sunshine into my life.